Muddling is the act of pressing an object to express its juices or essence into a cocktail. It will typically be one of the least expensive items in your bar drawer and does not have to be pretty. Typically made of wood, you want one that does not have a lacquered or painted surface, that fits snugly in the bottom of your mixing glass, and sits comfortably in the palm of your hand. We use the 11″ maple creations of Victor Firth along side the puckered stainless steel and plastic version from the engineers at Rösle. We use the puckered version for delicate muddling or for simply pressing the juice out of citrus. We’ll grab the flat-surfaced wooden muddlers for when we really want to mess something up! 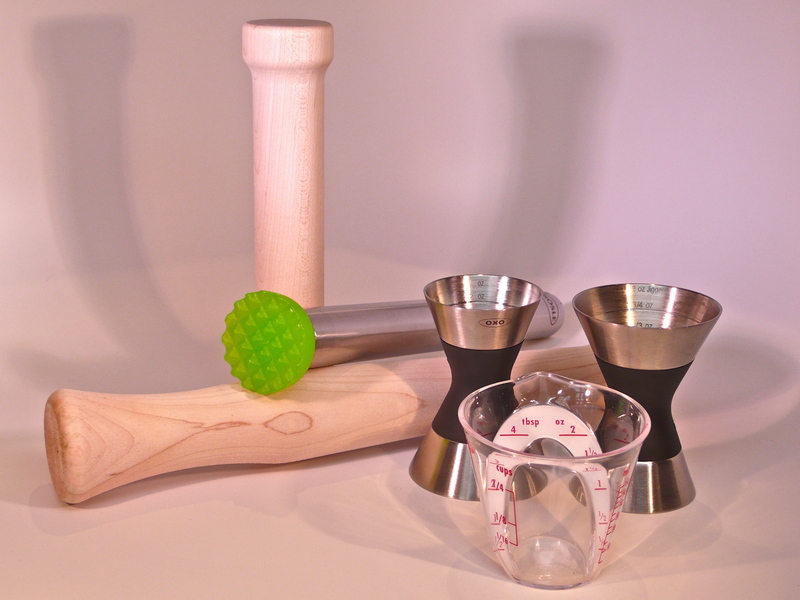 Whether measuring your ingredients with a conical jigger or a graduated measuring beaker, you’ll want to find the device that lets you most efficiently transfer the spirit from the bottle into your shaker or glass. We prefer the flexibility of Oxo’s graduated measuring pourers, feeling they are easy to read and use and are less messy than a double jigger which you are frequently turning over on end, time after time.